The Network Shares resource in GoAnywhere allows access to shared files and folders on a network. The Network Shares resource is based on the standard SMB/CIFS version 1, 2, 3, and 3.1.1 protocols used by Windows, Linux, Unix, Solaris, and IBM i. The Network Share resource provides the ability to access a network location using either the current Admin User's credentials or other domain user accounts. Network shares are configured as Resources in GoAnywhere and then specified as file repositories within Domains, or as Web User virtual folder locations. 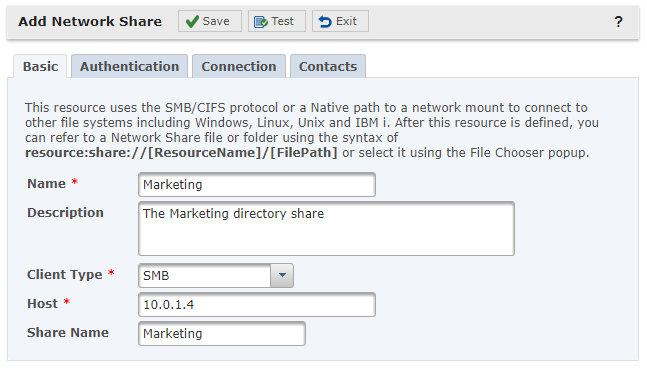 In the Network Shares Resource below, an administrator is creating an SMB connection to a network share that can be used to automate transfers to and from a designated server. Network Shares can also be configured to use the native client built into the operating system to connect to the network share. Request a quote to interface with network shares using GoAnywhere MFT.